Don't have time to make it to the gym, or need a change from your regular routine? Jamie Eason's full-body circuit workouts can be done at home with just one dumbbell! As a mother, wife, and fitness professional, I lead a pretty hectic life. My days are full of caring for my son, spending time with my husband, and working on my career—probably just like many of you! And, like you, sometimes, I'm so busy I hardly have time to make it to the gym! When those extra busy days roll in, I like to whip out one of these full-body circuit workouts. I can do them at home, at the gym, or if I'm travelling, even in my hotel room. The great thing is that these workouts will work in a pinch for you, too! 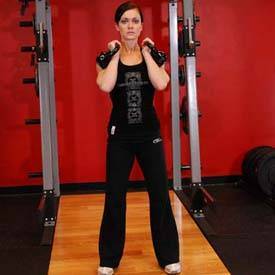 I really like these circuits because they train the entire body and are intense enough that they also provide a great cardiovascular workout! If you're tired of the treadmill and want to use one of these puppies on a normal lifting day, you can even add one of the workouts as your post-weight-training cardio session. Don't get too crazy, though. I suggest doing only one of these workouts per day. If you're not sweating buckets after you complete one, then you definitely need to increase the intensity or increase the number of rounds you perform!